BRIEF CAMP DESCRIPTION: Jam Camp West is an creative seven day (6 night) music, dance and vocal program held in the redwoods of Northern California. A great alternative to traditional music camps, Jam Camp West is an inclusive, supportive program that exposes kids to contemporary musical trends with the cultural underpinnings of jazz. Dance, Music/Band, Fine Arts/Crafts, Basketball, Swimming, and more. CAMP LOCATION: Jam Camp West is held in the stunning redwoods of Loma Mar, Northern CA (in the Santa Cruz mountains) about 1 1/2 hours drive from the Bay Area. CAMP FACILITIES: Jam Camp West is held at Redwood Glen Camp. The facility is a beautiful redwood site with multiple cabins, an outdoor amphitheater, beautiful swimming pool, large dining hall, and lots of open area to enjoy outdoor activities and classes under the trees. Housing is in shared cabins with bunk beds. All cabins have indoor bathroom facilities. ALL Star Faculty like Marcus Shelby, Terrence Brewer, Bryan Dyer, Josiah Woodson, Joshua Silverstein, Mark Rosenthal and More TBA!! 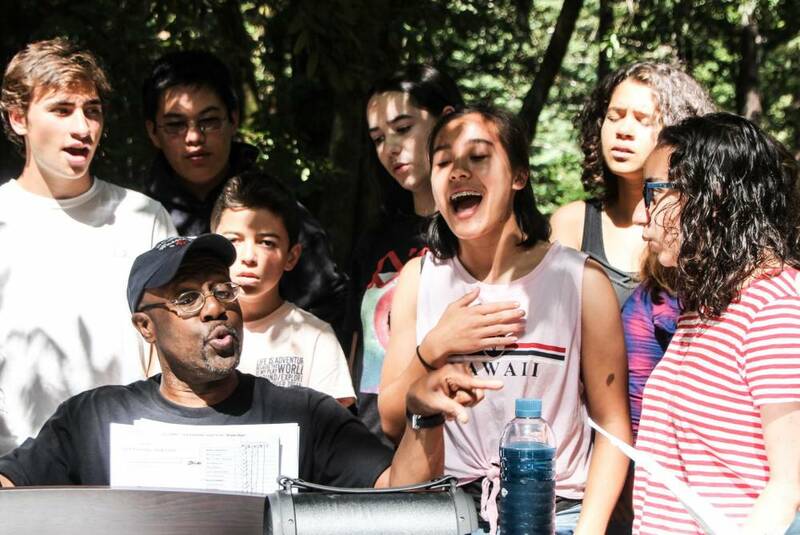 JAM Camp West is an exciting, creative and fun seven-day (6-night) music, dance and vocal program held in the stunning redwoods of Loma Mar, Northern CA (only 1 ½ hours drive from the Bay Area). The program is guaranteed to inspire great music, friendships, and lifelong memories. Designed exclusively for 10-15 year olds of all skill levels, JAM Camp West exposes youth to contemporary musical trends along with the cultural underpinnings of jazz including blues, hip-hop, rock and more. In addition, fun outdoor activities are held in a stunning natural environment. Whether your child has lots of previous experience or is a complete beginner, Jam Camp West’s program is designed to challenge your child at any level. With an all-star faculty, Jam Camp provides a unique opportunity to study with some of the most respected musicians and dancers from the Bay Area and beyond. Campers do not need special talents or skills to attend, only a sense of adventure and willingness to try. A great alternate to traditional music camps, JAM Camp West is an inclusive, supportive program where classes are taught by ear, offering hands-on group experiences and an array of classes that can reach youth through a diverse blend of musical styles and sounds they are listening to today. CAMP SCHOLARSHIPS OR FINANCIAL ASSISTANCE: Partial scholarships available based on financial need, not skill or experience. Applications can be found online on our website. YEAR-ROUND PROGRAMS: See Our Camp Website Link: www.livingjazz.org for more programs. Go to The Best California Summer Camps Directory to Find More Top Summer Camps Near Loma Mar, California.